Life with Shona, the ex-working foxhound had started so well, but after just two weeks we were at the doctor’s surgery having Mick’s badly bitten hand bandaged up. We had no idea what to do next, and the obvious option was too awful to contemplate. We’d collected Shona from Wood Green to fill a massive hole left by the passing of our St Bernard, Missy. Shona was quiet, confused, very wary of men and a stranger to everything the house presented to her. Having been a working dog before being rescued by Wood Green, it was no surprise that the carpet, television, fridge and all other appliances unnerved her, but she was also terrified by the sound of gunfire, which turned her into a restless jelly. As we live in the country, this was a real problem. After a few days she started to settle in, and two weeks after she’d joined us she concluded from our behaviour that my husband, Mick, was lower than her in the pecking order and she had to take control. It started when Mick gave Shona a fuss while she was in her bed. She growled at him, then bolted upstairs to me, barking. This got worse when Mick entered the bedroom and he had to move out of the way to allow me to take her downstairs. That was the start of an increasing spiral of nipping and aggression towards Mick, and it got to the point when he couldn’t move around the house without experiencing some sort of aggression from her. Advice from the Wood Green behaviourist, which probably usually works for ‘normal’ pet dogs, only exacerbated the situation and the only way to keep Mick safe was to keep them separated. This seemed to be working, so we gradually started to allow Shona access to Mick again, but one day when he returned home from work Shona bit his hand badly as he put it over the gate to open the catch. We were clearly out of our depth but we didn’t want to give up on Shona, so we called in a Dog Listener (Susan Matcham) who taught us the Amichien Bonding technique, which means learning to talk dog. She drew us up an Action plan to wrest leadership from Shona, which I posted on the fridge as a constant reminder for us, and visitors were briefed on how to follow the guidelines, which were also on clear display. It took just a couple of weeks for us to start to see a difference. As Mick regained his confidence with Shona, so she settled and her face softened. Several weeks later, her aggression towards Mick had stopped. I was completely convinced that Amichien Bonding was working the next time someone was shooting nearby. She jumped at the first bang, but looked at me, saw that I wasn’t worried and went back to sleep. Now she doesn’t even flinch on Bonfire Night, and will happily go outside while our neighbours are letting off fireworks. To this day we don’t allow her to mix with visitors until she has settled and they have been briefed. Shona is almost like any other dog, but we sustain our now excellent relationship with her through Amichien Bonding. These days she’s a chilled out dog without the heavy responsibility of looking after her pack, which now includes two other dogs and she can relax knowing that the myself and Mick don’t need her help, thank you very much. A comfy bed, a full tummy, warmth and sunshine with a good walk every day keeps her very happy indeed. The one aspect of Shona that has always been faultless is her behaviour with other dogs. Indeed, during her long stay at Wood Green she was used as the ‘test’ dog with new intakes, as she has such finely tuned social skills. With Amichien Bonding we use this canine language to good effect. 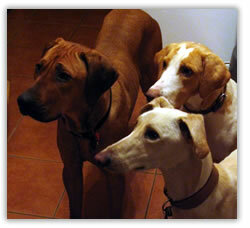 It also meant that taking on a young rescued lurcher, Jake, wasn’t a problem and the two settled in together nicely. As Jake gained strength (he came to us a walking skeleton) he wanted a playmate and was wearing Shona out. I had fond memories of our family Rhodesian Ridgeback Pippa, so when we saw that 10-month-old Coco had been handed in to Wood Green for rehoming we didn’t hesitate to adopt her. Coco was incredibly confused and lacking in confidence, which manifested as bad behaviour. She had limited social skills but mixed well with Shona and Jake. Coco grew in confidence (and stamina as she tried to keep up with Jake.) She is interested in everything, her intelligence obvious, but in the first weeks her need for reassurance had her constantly in our faces. We apply the Amichien Bonding technique to all of our dogs and it contributed greatly to her soon finding her confidence and place in the pack, helped by plenty of patience. She is rather like the big kid in the group with 10 thumbs and no spatial awareness, but with her new confidence and natural love for the pack she is dependable and gentle. She demonstrated all that was best about her recently when we took her on a walking holiday in Pembrokeshire. Shona likes her routine and Jake lacks the stamina for long walks, so they went on holiday on their own to our usual kennels (where Shona is truly adored.) Coco, who we’d had to lift into the car when she came from Wood Green because she was so terrified of it, travelled the 300 miles without fuss and thoroughly enjoyed the long walks, at all times behaving impeccably. She is a beautiful dog, as many, many people commented, and several times we found ourselves using her as an example to refute the silly stories about all Ridgebacks being naturally vicious. It was a lovely holiday, made even more so by the company of a lovely dog that her previous owners had, incredibly, rejected from their lives. Shona has been with us for nearly four years now, and will be 10 years old very soon. We feel privileged to have been able to allow her to relax and enjoy the latter part of her life, thanks to Wood Green rescuing her and getting her back to good health, Sue Matcham and Amichien Bonding.